Like a lot of people who work in IT as their day job, the IT situation at my house is a bit of a mess. I think the real reason for this is because, once the working day is done, I don’t want to put any thought into doing this kind of stuff. As a result, like a lot of tech folk, I have way more devices and blinking lights in my house than I really need. And I’m always sure to pile on a good helping of technical debt any time I make any changes at home. It wouldn’t be any fun without random issues to deal with from time to time. I’ve been running an Apple Airport Extreme and a number of Airport Express devices in my house for a while in a mesh network configuration. Our house is 2 storeys and it was too hard to wire up properly with Ethernet after we bought it. I liked the Apple devices primarily because of the easy to use interface (via browser or phone), and Airplay, in my mind at least, was a killer feature. So I’ve stuck with these things for some time, despite the frequent flakiness I experienced with the mesh network (I’d often end up connected to an isolated access point with no network access – a reboot of the base station seemed to fix this) and the sometimes frustrating lack of visibility into what was going on in the network. I had some Frequent Flier points available that meant I could get a 3-pack of Google access points for under $200 AU (I think that’s about $15 in US currency). I’d already put up the Christmas tree, so I figured I could waste a few hours on re-doing the home network. I’m not going to do a full review of the Google Wifi solution, but if you’re interested in that kind of thing, Josh Odgers does a great job of that here. In short, it took me about an hour to place the three access points in the house and get everything connected. I have about 30 – 40 devices running, some of which are hardwired to a switch connected to my ISP’s NBN gateway, and most of which connect wirelessly. The problem was that I’d kind of just jammed the primary Google Wifi point into the network (attached to a dumb switch downstream of the modem). As a result, everything connecting wirelessly via the Google network had an IP range of 192.168.86.x, and all of my other devices were in the existing 10.x.x.x range. This wasn’t a massive problem, as the Google solution does a great job of routing stuff between the “wan” and “lan” subnets, but I started to notice that my pi-hole device wasn’t picking up hostnames properly, and some devices were getting confused about which DNS to use. Oh, and my port mapping for Plex was a bit messed up too. I also had wired devices (i.e. my desktop machine) that couldn’t see Airplay devices on the wireless network without turning on Wifi. After a lot of Googling, I found part of the solution via this Reddit thread. Basically, what I needed to do was follow a more structured topology, with my primary Google device hanging off my ISP’s switch (and connected via the “wan” port on the Google Wifi device). I then connected the “lan” port on the Google device to my downstream switch (the one with the pi-hole, NAS devices, and other stuff connected to it). Now the pi-hole could play nicely on the network, and I could point my devices to it as the DNS server via the Google interface. I also added a few more reservations into my existing list of hostnames on the pi-hole (instructions here) so that it could correctly identify any non-DHCP clients. I also changed the DHCP range on the Google Wifi to a single IP address (the one used by the pi-hole) and made sure that there was a reservation set for the pi-hole on the Google side of things. The reason for this (I think) is that you can’t disable DHCP on the Google Wifi device. To solve the Plex port mapping issue, I set a manual port mapping on my ISP modem and pointed it to the static IP address of the primary Google Wifi device. I then created a port mapping on the Google side of things to point to my Plex Media Server. It took a little while, but eventually everything started to work. It’s also worth noting that I was able to reconfigure the Airport Express devices connected to speakers to join the new Wifi network and I can still use Airplay around the house as I did before. This seems like a lot of mucking about for what is meant to be a plug and play wireless solution. In Google’s defence though, my home network topology is a bit more fiddly than the average punter’s would be. If I wasn’t so in love with pi-hole, and didn’t have devices that I wanted to use static IP addresses and DNS, then I wouldn’t have had as many problems as I did with the setup. From a performance and usability standpoint, I think the Google solution is excellent. Of course, this might all go to hell in a hand basket when I ramp up IPv6 in the house, but for now it’s been working well. Coupled with the fact that my networking skills are pretty subpar and we should all just be happy I was able to post this article on the Internet from my house. My HTPC (running Windows 7 Media Center) died a few months ago after around 5 or 6 years of service. It was a shame as I had used it as a backup for my TV recordings and also to rip optical discs to my NAS. At the time it died I was about to depart on a business trip and I couldn’t be bothered trying to work out why it died. So I gave the carcass of the machine to my nephew (who’s learning about PC hardware things) and tried to put something together using other machines in my house (namely an iMac and some other odds and sods). I’m obviously not the first person to use a Mac for these activities, but I thought it would be useful to capture my experiences. Requirements? Isn’t this just for home entertainment? Whatever, relaxation is important, and understanding your users is as well. We record a lot of free to air tv with a Fetch Mighty box and sometimes things clash. Or don’t record. “Catch-up” TV services in Australia are improving a lot, but our Netflix catalogue is nowhere near as extensive as the US one. So I like to have a backup option for TV recording. The HTPC provided that. And it had that cool Media Center extender option with the Xbox360 that was actually quite useable and meant I didn’t need a PC sitting in the lounge room. From a movie consumption perspective, we mostly watch stuff using various clients such as AppleTV or WDTV devices, so the HTPC didn’t really impact anything there, although the way I got data from Blu-ray / DVD / HD-DVD / VCD was impacted as my iMac didn’t have a Blu-ray player attached. Okay, the SuperDrive could deal with VideoCDs, but you get my point. Grab accurate metadata for that media for use with Plex. The solution was fairly easy to put together when I thought about what I actually needed. I backed a Kickstarter for the HDHomeRun Connect some time ago and hadn’t really used the device very effectively save for the odd VLC stream on an iPad. It’s a dual-tuner device that sits on your wired network and is addressable by a few different applications over IP. The good news is that Elgato EyeTV works with both macOS and IceTV (a local TV guide provider) and also supports the HDHomeRun. I haven’t tested multiple HDHomeRun devices with the same EyeTV software and I’m not 100% convinced that this would work. I had 8 tuners on the HTPC so this is a bit of a bummer, but as it’s not the primary recording device I can live with it. The EyeTV software supports multiple export options too, so I can push shows into iTunes and have AppleTV pick them up there. I bought a USB-based Pioneer (BDR-XS06) Blu-ray drive that works with macOS, and MakeMKV is still my go to in terms of mkv ripping. It maxes out at 2x. I’m not sure if this is a macOS limitation or firmware crippling or some other thing. Now that I think about it, it’s likely the USB bus on my iMac. If anyone wants to send me a Thunderbolt dock I’m happy to try that out as an alternative. In any case a standard movie Blu-ray takes just shy of an hour to rip. It does work though. If I still need to rip HD-DVDs I can use the drive from the Xbox360 that I have laying about. What? I like to have options. For movie metadata I settled on MediaElch for scraping and have found it to be easy to use and reliable. Why bother with scraping metadata? It sometimes saves a bit of effort when Plex gets the match wrong. I run Plex as the primary media server for the house (using either iPad, rasplex or AppleTV), with content being served from a number of NAS devices. It took me a while to get on board with Plex, but the ability to install the app on a 4th generation AppleTV and the portability of media has been useful at times (think plane trips on economy airlines where entertainment is an extra charge). Plex are working on a bunch of cool new features, and I’m going to try and make some time to test out the DVR functionality in the near future. I’ve also recently started to use the auto_master file as the mechanism for mounting my SMB shares automatically on the iMac. I found User-based Login Items method was a bit flaky and shares would disappear every now and then and confuse Plex. I have three NAS devices all using a variation of the name “Multimedia” as their main share (no I didn’t really think this deployment through). As a result my iMac mounts them under Volumes as “Multimedia-1”, “Multimedia-2”, etc. This is fine, but then depending on the order they’re mounted in when the machine reboots can mess up things a bit. The process to use auto_master is fairly simple and can be found here. I’ve included an overview for your enjoyment. Firstly, fire up a terminal session and make a /mnt directory if you don’t have one already. You’ll then want to edit setup the auto_master file to look at auto_fs when it runs. You should also ensure the NAS directory exists (if it doesn’t already). You can now create / modify the auto_nas file and include mount points, credentials and the shares. Now run your automount command. Once this is done you’ll want to test that it works. Note that if you’re having issues with a “Too many users” error, it may be because you’re using a special character (like @) in your password and this is messing up the syntax for auto_master. Check this post for a resolution. Once you’ve sorted that it will look more like this. It’s also a good idea to apply some permissions to that auto_nas file because you’re storing credentials in there in plain text. And now you can point Plex at these mount points and you shouldn’t have any problems with SMB shares disappearing randomly. I’ve read a lot of reports of this functionality being broken in more recent versions of macOS. I’ve also witnessed shares disappear and get remounted with root permissions. This is obviously not ideal. There are a number of solutions floating around, including running a bash script to unmount the devices as root and then change directory as a normal user (prompting autofs to remount as that user). I found something in a forum somewhere the suggestion that I use -nosuid in my auto_master file. I did this and rebooted and the drives seem to have mounted as me rather than root. I’ll keep an eye on this and see if it continues to work or whether autofs remounts the shares as root. This would seem a non-ideal solution in a multi-user environment but that’s outside my ken at this stage. I ended up having problems with the auto_master method as well, and decided to create new shares on the various NAS devices with different names. These then mount as /Volumes/nas1data, /Volumes/nas2data, etc. So theoretically even if I lose the connection I can remount them manually and know that they’ll come up with a consistent path name and Plex won’t get too confused. I dragged these mounted volumes into my Login Items so that they mount every time the machine reboots. It still bites that they disappear every now and then though. I recently threw out my RealMagic Hollywood+ XP cards. Those things were great at a time when playing DVDs on a PC was a real challenge. I remember being excited to play full screen MPEG-2 movies on my NT 4 Workstation running on a Pentium 133. Fast forward to about 8-10 years ago and it seemed everyone was running some kind of “Media Center” PC at home and consuming everything via that. Nowadays people tell me to “just stream it”. But I don’t live in a terribly bandwidth rich environment, and downloading 4GB of data from the Internet to watch a movie needs a little more prior planning than I’d like to do. So I’m still a big fan of physical discs, and still recording television shows via a PVR or via the iMac. I still have a dream that one day I’ll happen upon the perfect user experience where I can consume whatever digital media I want in the fashion I want to. I’ve tried an awful lot of combinations in terms of backend and frontend and Plex is pretty close to doing everything I need. They don’t like ISO files though (which is justifiable, for sure). I rip most things in mkv containers now, and all of my iTunes content (well, the music at least) is pretty easy to consume, but there’re still some things that aren’t as easy to view. I still haven’t found a reliable way to consume UltraViolet content on a big screen (although I think I could do something with AirPlay). I’ve been reading a bit about various cable boxes in the US that can scan both local and streaming data for whatever you’re after and point you in the right direction. I guess this would be the way to go if you had access to reasonable bandwidth and decent content provider choices. In any case, it’s still possible to run a HTPC the old-fashioned way with macOS. I’d like to be very clear up front that this post isn’t intended as a swipe at people with faith. I have faith. Really, it’s a swipe at people who can’t use the tools available to them. I get cranky when IT decisions are based on feelings rather than data. 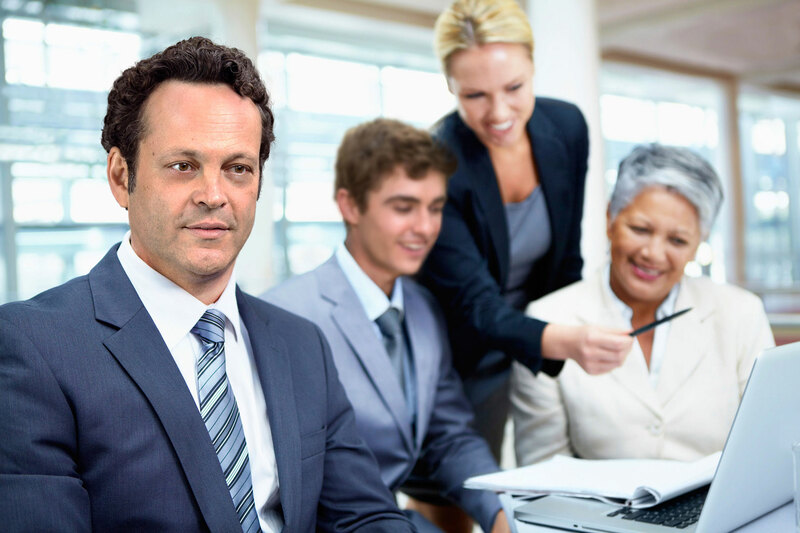 As an example, I’ve been talking to someone recently about who has outsourced support of their IT to a third party. However, they’re struggling immensely with their inability to trust someone else looking after their infrastructure. I asked them why it was a problem. They told me they didn’t think the other party could do it as well as they did. I asked for evidence of this assertion. There was none forthcoming. Rather, they just didn’t feel that the other party could do the job. In IT organisations / operations there’s a lot of data available. You can get uptime statistics, performance statistics, measurements of performance against time allocated for case resolution, all kinds of stuff. And you can get it not only from your internal IT department, but also from your vendors, and across most technology in the stack from the backend to the client-facing endpoint. Everyone’s into data nowadays, and everyone wants to show you theirs. So what I don’t understand is why some people insist on ignoring the data at hand, making decisions based solely on “feelings” rather than the empirical evidence laid out in front of them. I call this focus on instinct “faith-based computing”. It’s similar to faith-based medicine. While I’m a believer, I’m also a great advocate of going to my doctor when I’m suffering from an ailment. Pray for my speedy recovery by all means, but don’t stop me from talking to people of science. Faith-based computing is the idea that you can make significant decisions regarding IT based on instinct rather than the data in front of you. I’m not suggesting that in life there aren’t opportunities for instinct to play a bigger part in how you do things rather than scientific data, but IT has technology in the name. Technology is a science, not a pseudo-science like numerology. Sure, I agree there’re a bunch of factors that influence our decision-making, including education, cultural background, shiny things, all kinds of stuff. I come across organisations on a daily basis operating without making good use of the data in front of them. This arguably keeps me in business as a consultant, but doesn’t necessarily make it fun for you. Use the metrics at hand. If you must make a decision based on instinct or non-technical data, at least be sure that you’ve evaluated the available data. Don’t just dismiss things out of hand because you don’t feel like it’s right. So I now know too much about how to recover old files from iPad backups. I know this isn’t exactly my bread and butter, but I found the process fascinating, and thought it was worth documenting the process here. It all started when I upgraded my wife’s iPad 2 to iOS 8. Bad idea. Basically, it ran like rubbish and was pretty close to unusable. So I rolled it back, using the instructions here. Ok, so that’s cool, but it turns out I can’t restore the data from a backup because that was made with iOS 8 and wasn’t compatible with iOS 7.1.2. Okay, fine, it was probably time to clear out some apps, and all of the photos were saved on the desktop, so no big deal. Fast forward a few days, and we realise that all of her notes were on that device. Now for the fun bit. Note that I’m using a Mac. No idea what you need to do on a Windows machine, but I imagine it’s not too dissimilar. Step 3. Now you’ll want to go to the normal location of your iPad backups and rename your current backup to something else. 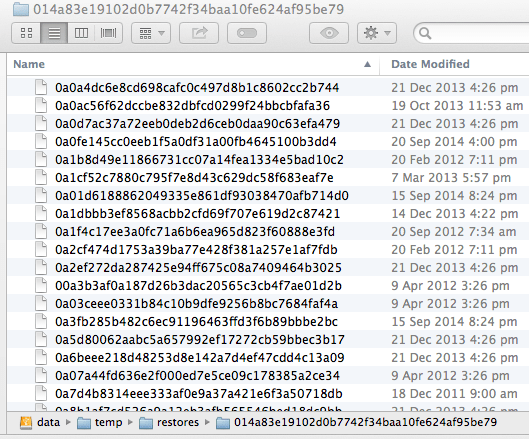 Then copy the files that you recovered from Time Machine to this location. Step 4. At this point, I followed these quite excellent instructions from Chris Taylor and used the pretty neat iPhone Backup Extractor to extract the files I needed. Once you’ve extracted the files, you’ll have something like this. 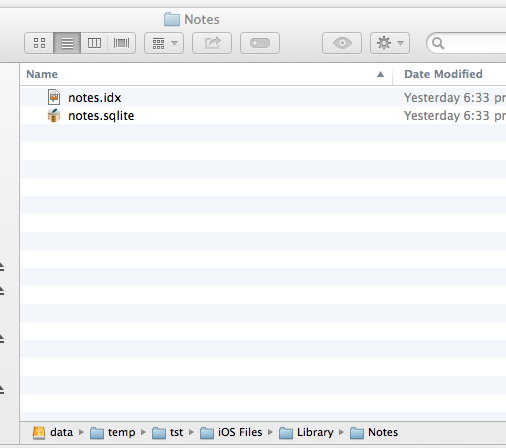 Note the path of the files is iOS Files/Library/Notes. Step 5. At this point, fire up MesaSQLite and open up the “notes.sqlite” file as per the instructions on Chris’s post. Fantastic, I’ve got access to the text from the notes. Except they have a bunch of html tags in them and are generally unformatted. Well, I’m pretty lazy, so I used the tool at Web 2.0 Generators to decode the html to formatted text for insertion into Notes.app files. And that’s it. Conclusion. As it happens, I’ve now set this iPad up with iCloud synchronisation. *Theoretically* I won’t need to do this again. Nor should I have had to do it in the first place. But I’ve never come across an update that was quite so ugly on particular iDevices. Thanks to Apple for the learning opportunity.